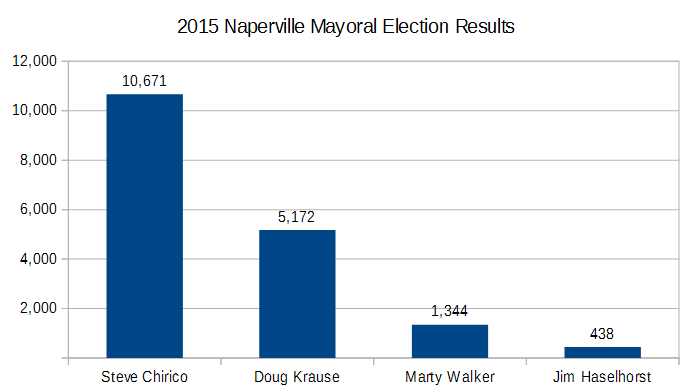 It was just a little over two years ago that Steve Chirico was elected mayor or Naperville, which means in less than two years from now (2019) we will have had another mayoral election. It remains to be seen if Chirico will run for re-election for his second term out of a possible three terms. It’s not only possible, but probable that he could have another ten years in office. It’s very difficult to unseat an incumbent, especially if things are running smoothly and voters are satisfied if not content. In 2015 mayor George Pradel chose not to run for re-election, opening the field for four mayoral candidates including then councilmen Steve Chirico and Doug Krause, along with Marty Walker and Jim Haselhorst. Krause had years of experience on the council and name recognition. If you didn’t know him from the council, you definitely knew him for his ‘For Sale’ real estate signs throughout Naperville. He was a perennial mayoral candidate coming in second place time and again to Mayor Pradel. With Pradel gone, he decided to give it one last run, however with the same result; this time second place to Chirico. Steve Chirico ran a strong race, with modest funding, a solid campaign, and efficient organization. It was a difficult formula to beat. Marty Walker and Jim Haselhorst filled out the ticket, but neither exhibited the energy or desire to do what was necessary to win. Many thought Krause could finally win, but when the dust settled, Chirico beat Krause by a two to one margin. Walker finished with 8% of the vote, and Haselhorst brought up the rear with a paltry 2%. In fairness to Walker and Haselhorst, they both did better than expected. The current Naperville city council with eight members not including the mayor, may over the next two years surface a mayoral candidate or two to challenge Chirico. Councilwoman Rebecca Boyd-Obarski has been coming on strong lately during council meetings, councilman Paul Hinterlong has a loyal base of voters, but he could become the new Krause. Councilman Kevin Coyne’s Harry S. Truman style, is sincere and effective but not flashy enough to tip the scale in his favor, and councilman John Krummen would have a slim, outside chance of contending, if the forums were on radio, but in-person appearances, podiums, and television are no friends of his. Trump came out of nowhere to win it, so that could happen in Naperville too, but as of now, the smart money has to be on Mayor Chirico to win re-election.